Wedding Photos in Mystic are characterized by coastal views, and the joy that radiates throughout the wedding day. 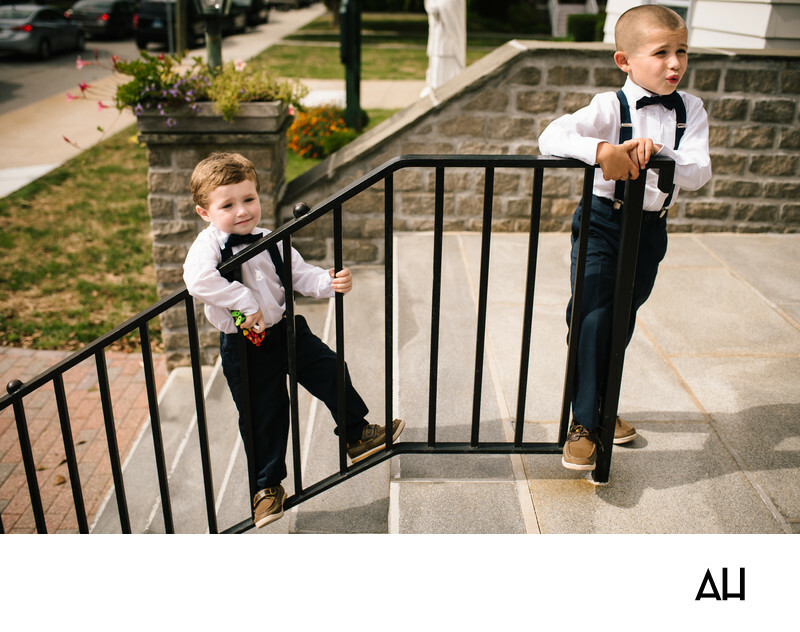 In this image from a selection of Wedding Photos in Mystic, two little ring bearers play on the steps of the church as they wait for the ceremony to begin. It is an early fall day: the air is still tinged with the warmth of summer days, but leaves have begun to appear, scattered on the grass and on the walkways. The two little boys wear dark dress pants, white dress shirts, suspenders, and bow ties. On their feet they wear brown loafers, the older boy with laces that tie and the younger with velcro. The pair climb on the railing and race up and down the stairs to pass the time while the adults get ready for the wedding ceremony. They observe the grown ups in the bridal party, but also continue to play. The younger boy holds an action figure in his small hand, extra incentive from his mother to behave. Soon the two will follow the bridesmaids into the church and down the aisle, holding the ring to give to the bride and groom when they reach the front. Neither of the boys is nervous about his job, the two are just ready to get the show on the road. They have been waiting all morning for the party that they were told would come after the ceremony, and they really just can’t wait to run around and have some of that cake they were promised.